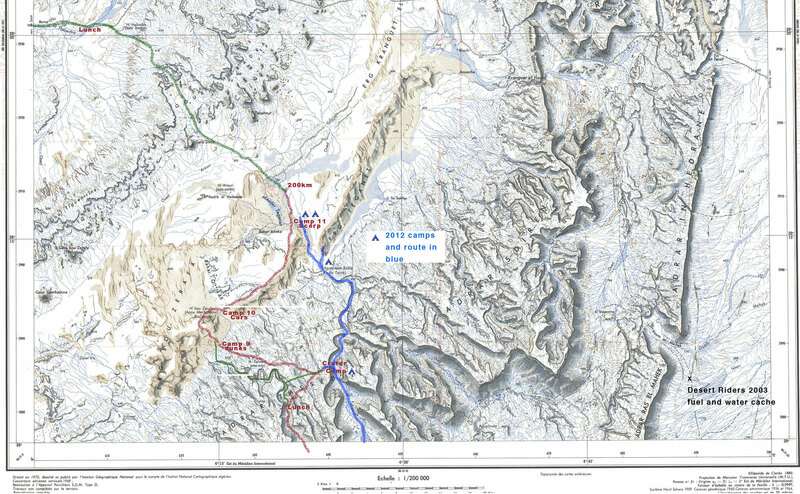 As on previous occasions, the route of our camel trek through the Immidir will rest a day at Aguelmam Rahla – a reliable waterhole at the mouth of the Oued Tafrakrek canyon (blue line on map, left) where the Tissedit plateau drops down to meet a band of dunes. I’d been wanting to make a diversion here since scanning Google Earth a few years back and noticing the innumerable pre-Islamic tombs (‘PIZ’) in the area (right). 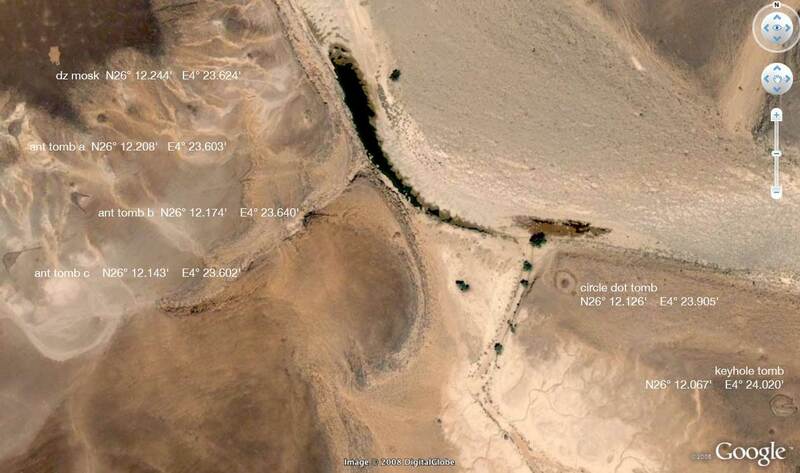 Looking again on Google Earth some time later, less than an hour of nosing around revelled three dozen keyhole, antenna or crescent tombs within a few kilometres of the waterhole (snapshot left or zoom right in on the link above). I didn’t bother counting the less distinctive ‘mound’ tombs. In fact the proliferation of tombs here isn’t so unusual: the topographic features already listed: edge of a plateau, former river mouth, band of dunes, are all common factors adding up to a Neolithic occupation site. 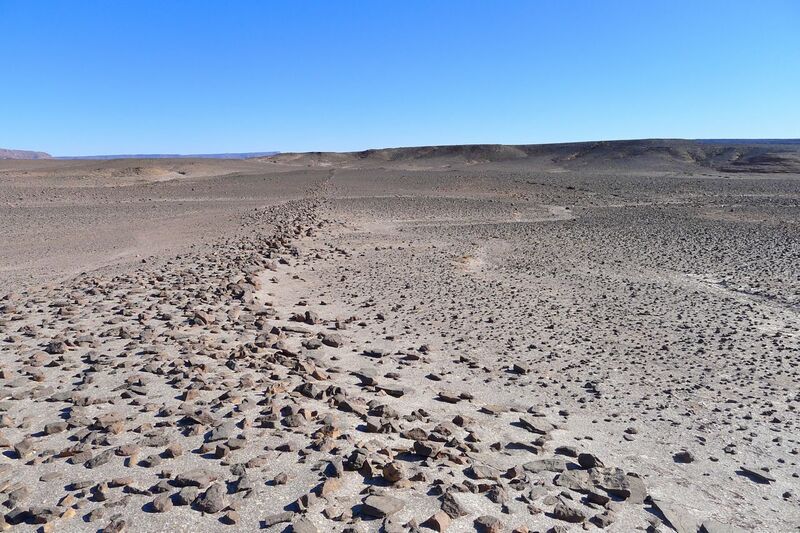 On the first crater tour in 2007 we walked along the base of the dunes, northeast from Aguelmam Rahla, and discovered several grinding stones and other artefacts at the foot of the dunes. And in 2012 one of us came across a near intact pot (left) at the foot of a dune as well as napping (stone tool chipping) sites. 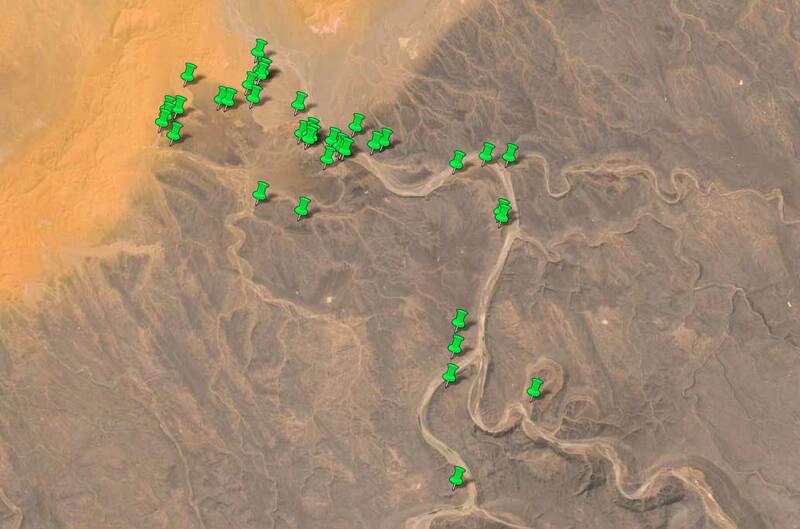 There’s something compulsive about Sahara tomb spotting on Google Earth, searching the featureless desert floor for the clear signs of prehistoric human activity. Once out there it gives a purpose to a journey that’s otherwise just agreeable recreation and adds a hint of treasure hunting. It reminds you that the Sahara of 6000 years ago was not the desert of today, but a much less arid savannah. As mentioned in the Mark Milburn book review, among others, KenGrok has spent hours and years scanning Google Earth’s imagery to identify unusual things, including pre-Islamic tombs in the Sahara. It seems his baton has since been picked up by others. 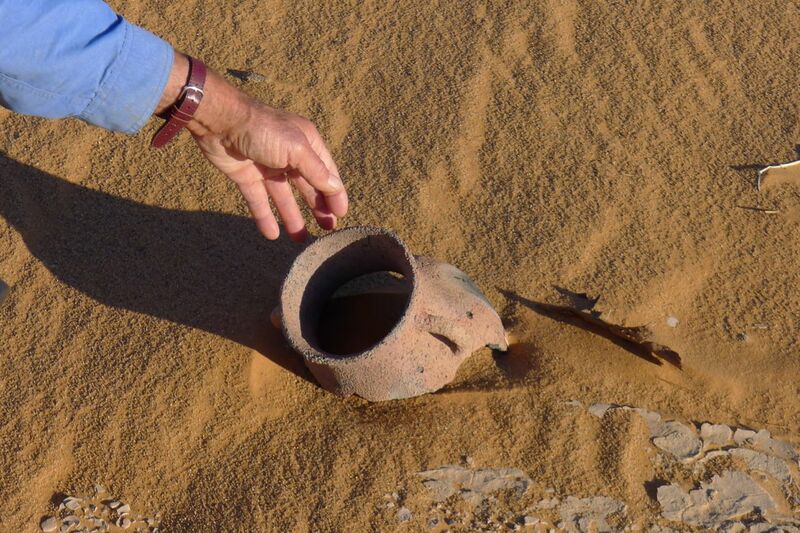 Often this fascination and excitement falls a little flat on actually finding a tomb on the desert floor. 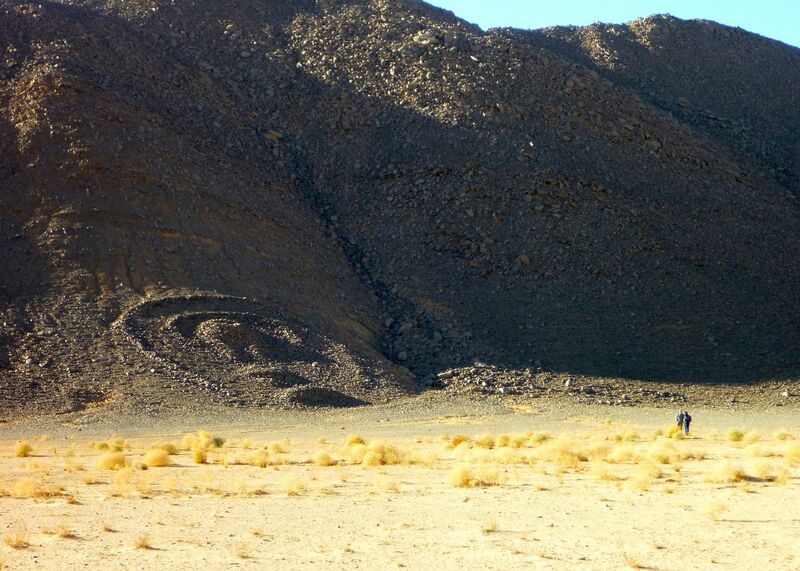 On the 2012 trip I was excited about finding a huge antenna tomb that lay close our path on Day 6 or so. On GE (above) the massive structure with a ring-angle span of over 300m looked amazing, but by the time we tracked it down it (left) was too big to appreciate from ground level. My group seemed to say… ‘and the purpose if this diversion was…?’. 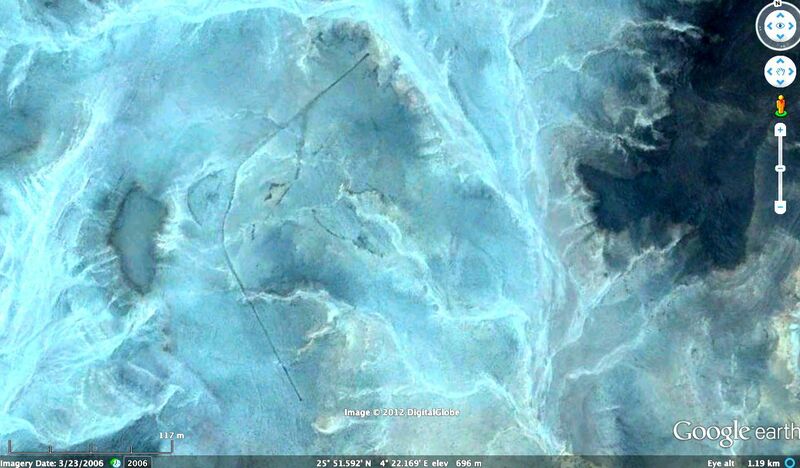 ‘Flying’ over these tombs on satellite imagery, like Peru’s Nazca lines, is how they’re best appreciated. How old are these ‘pre-Islamic’ tombs? Well in the central Sahara I’d say the Islamic era began to have an impact a couple of hundred years after the Arab Conquest of North Africa between AD 647–709. I imagine this swept like a tide west along the south Mediterranean coast, down the Atlantic to present-day Mauritania and then ‘eddied’ back west towards places like Timbuktu. Other eddies may have spun off sooner to places like Ghadames in Libya, following trans-Saharan trade routes into the interior. Chances are these tombs, like the huge keyhole on the right in the Immidir (middle left of the picture; some 60m across), are only around two thousand years old, maybe double that. That means after the apogee of rock art some 6000 years ago following a climate changes which populated what is now the Sahara. By this time megalithic tombs became widespread across the ancient world, most spectacularly of course in ancient Egypt. What’s interesting is the orientation of these tombs is almost always towards the east; you may have noticed that by looking closely at the link above. 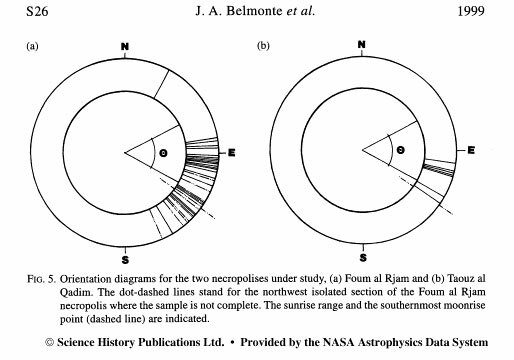 Be it a keyhole with a ‘walkway/slot’ or the open arms of an antenna, the orientation is always eastwards within the range of the rising sun, according to the diagram, left, with concomitant suggestions of ‘rebirth’ and and afterlife. 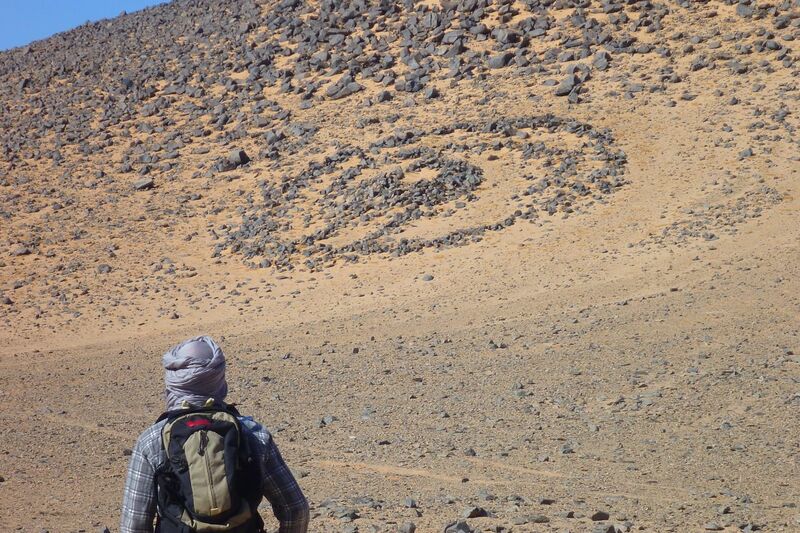 You don’t have to venture into the deep Sahara to see keyhole tombs. 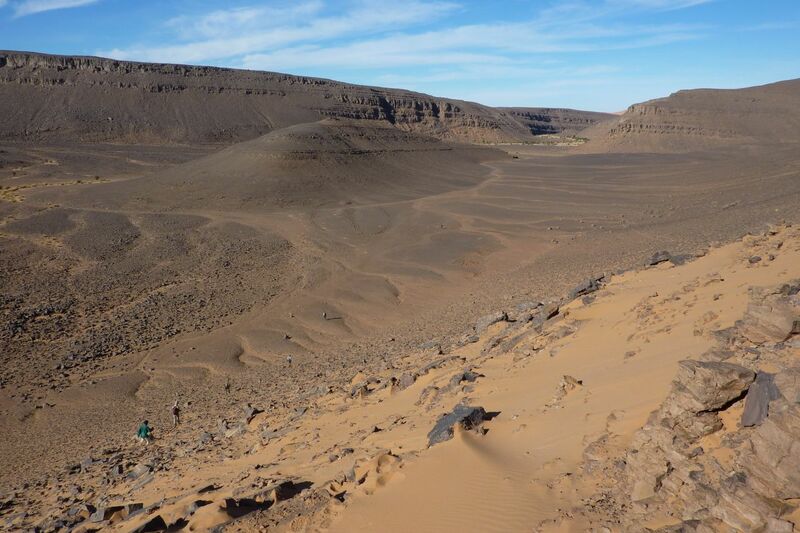 In southern Morocco, just a short distance from Erg Chebbi and three miles west of Taouz, on the west side of the Oued Ziz are a cluster of tombs. Like Aguelmam Rahla they’re situated on the edge of a plateau and by a former big river as well as an erg – and not all with entrance ways pointing east. 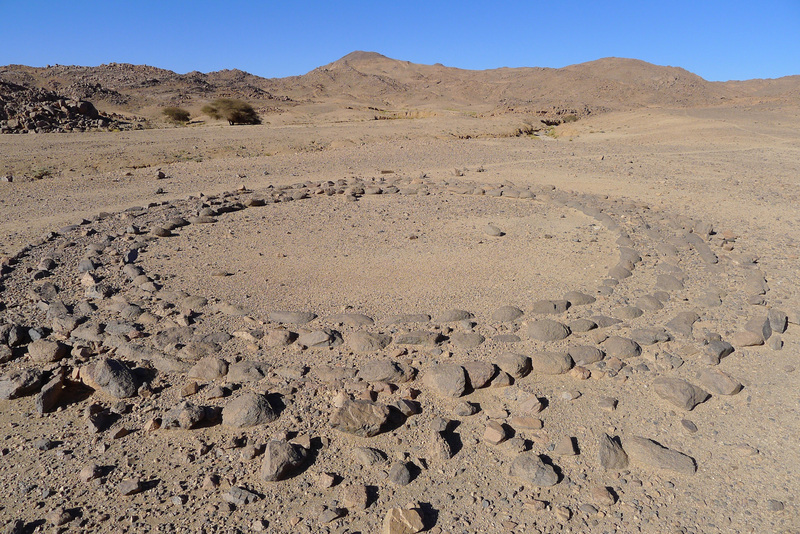 Below, a curious structure on the Oued Tagant valley midway between Tam and Djanet. And below that, another in the Hoggar, just southeast of Assekrem. I’ve seen these elsewhere in southern Algeria but their meaning is unknown. 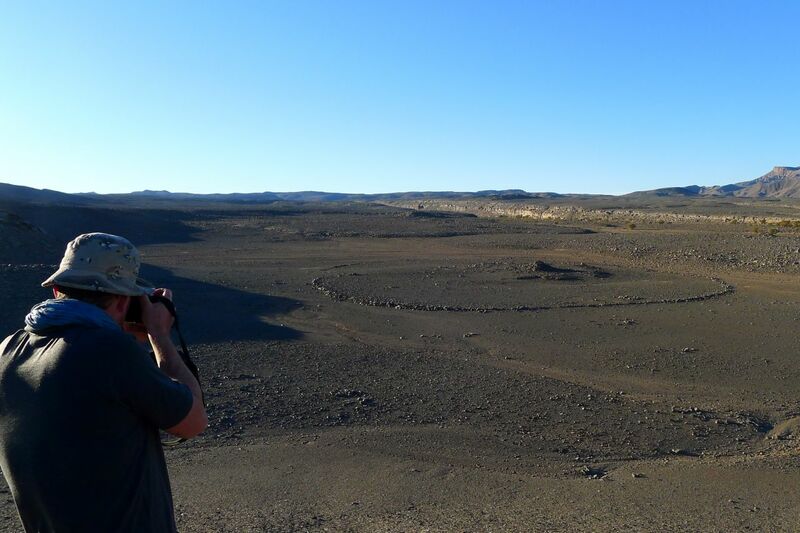 The guides and old Saharan expeditions just call them ‘tombs’. 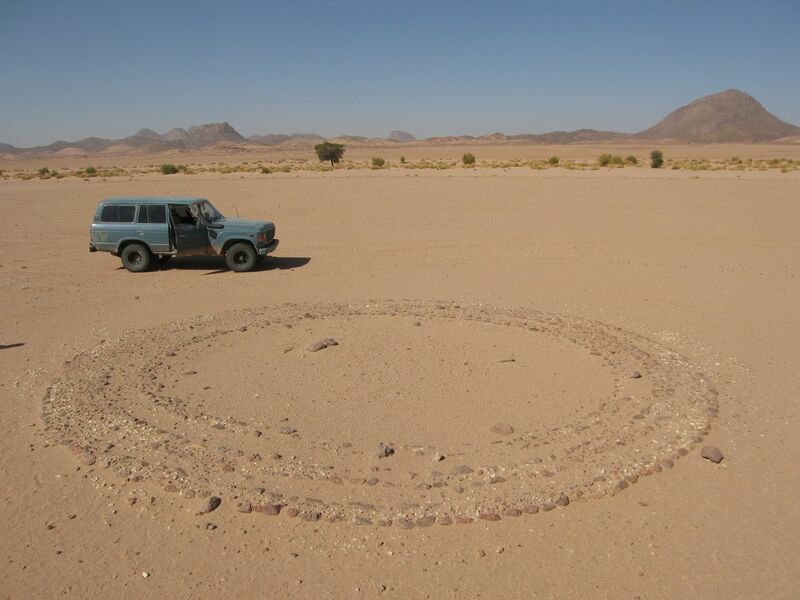 This entry was posted in Desert Babbles (blog), Sahara A to Z... and tagged aguelmam rahla, erg bou zerafa, Erg Chebbi, Google Earth, immidir, KenGrok, mark milburn, Oued Ziz tombs, pre-islamic tombs in sahara, tissedit plateau on August 19, 2013 by Chris S.